Sketchbook_elokuu 15, 2010_11-2, originally uploaded by Brin d’Acier. 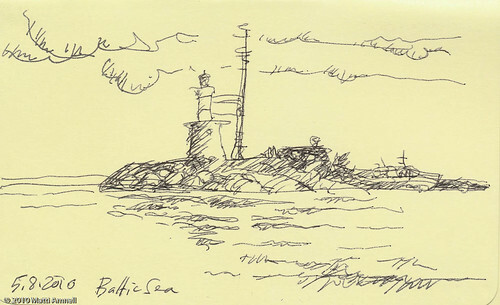 Drawn from the boat between Helsinki and Tallinn. Luckily there’s still time for a long weekend away. Sketchbook_August 09, 2010_3, originally uploaded by Brin d’Acier. Tallinn old town, seen from Toompea ramparts. Tallinn is just two hours away from Helsinki, but it’s another world. An older and in many ways more cultured city, full of history. No city in Finland has managed to keep its medieval center intact, and Helsinki is a new town, mostly built in the 19th -20th century. Sketchbook_August 06, 2010_10, originally uploaded by Brin d’Acier. 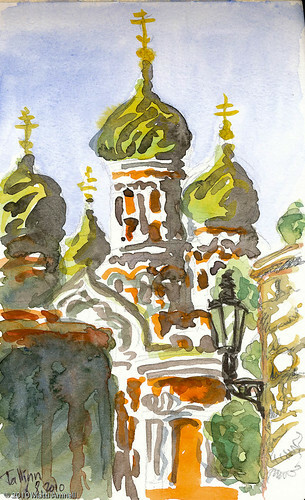 Done in watercolour from a sidewalk café in Tallinn. 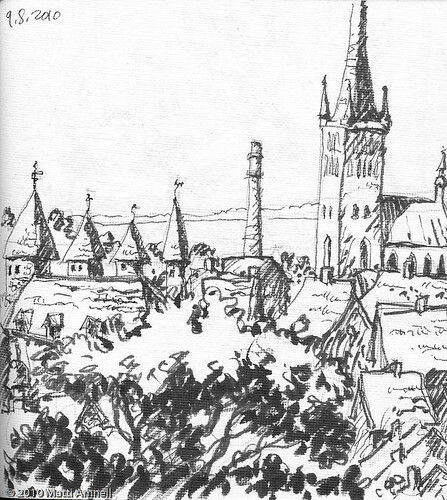 This entry was posted in travel journal and tagged architecture, city, ink, tallinn, watercolour. Bookmark the permalink.